Recent studies have shown Periodontal Disease as a risk factor in experiencing major diseases such as heart disease, stroke, diabetes, osteoporosis, and premature births. Because of that, it is very important to know the causes of the problem, as well as the way to prevent it from occurring. 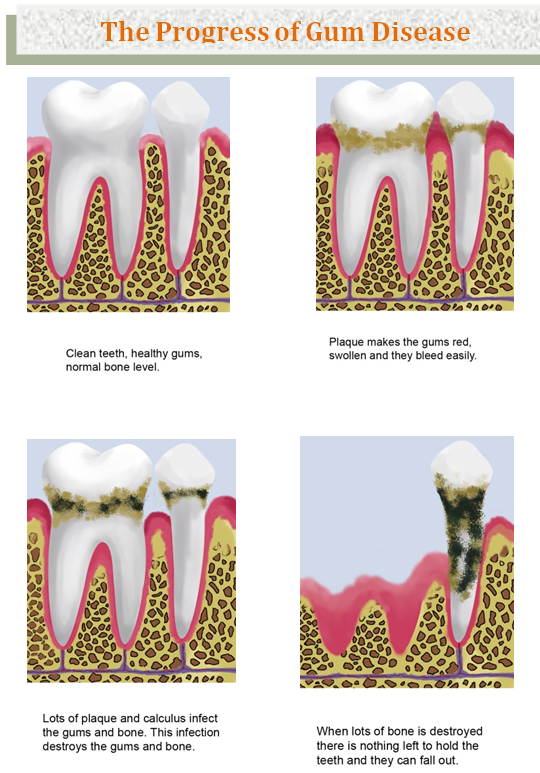 The biggest cause of gum disease is plaque build up. People think they can completely fight off plaque by brushing their teeth. Brushing your teeth at home is important, but it is not the only tool you need to keep periodontal disease at bay. A lot of people cannot remove all the plaque by just using the toothbrush. 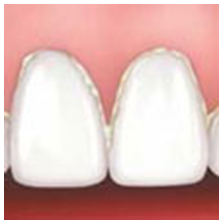 Hard plaque forms below the gums over time which can only be removed with deep cleaning by dental professionals. Without deep cleaning, the plaque and bacteria will thrive, and will lead to Periodontal Disease. There are other causes of concern that our Bondi Dental dentist can address, such as smoking, diabetes, stress, and some medications. Our dental professionals at Bondi Dental in Bondi Sydney can work with you to keep periodontal disease from happening to you. They have the knowledge, experience, and instruments to fight against and prevent Periodontal Disease, even when you have risk factors that make you a candidate. This is the first stage of gum disease. The symptoms are red and swollen or bleeding gums caused by inflammation of the gums due to build up of plaque at the gum line. Plaque and bacteria accumulated will produce toxins which irritate the gum tissue, as a result the gums become red, swollen or will bleed when you brush your teeth. At this early stage, when the bone and gum tissues have not been affected, the condition can be easily and effectively treated by your visiting the dentist or dental professional to remove the plaque (Active Dental Maintenance), followed by your proper daily brushing and flossing. In a couple of weeks, your gums will heal and become pinkish (the colour of healthy gums) again. If the plaque is allowed to accumulate for an extended length of time, the irritation of the gums continues. The gum and its connecting tissues will shrink exposing the root and the bone structures. 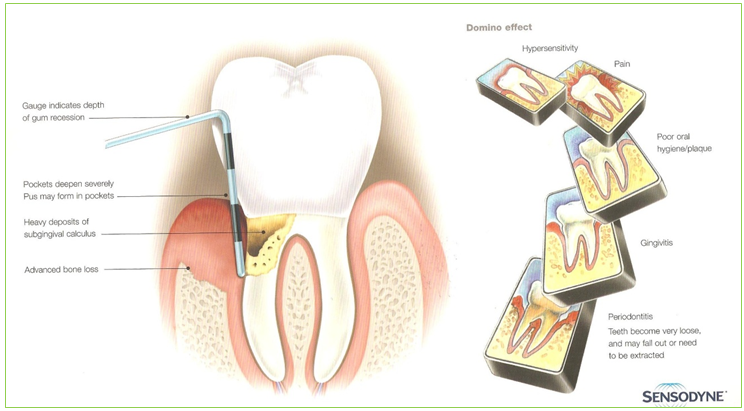 Due to shrinkage of the gums, a pocket will also form below the gum line and this pocket will trap more food and plaque. It is much like a vicious cycle. At this stage, it is most advisable for you to see a dentist or a dental professional to start a treatment program to prevent further bone loss. It has always been a misconception that people lose their teeth when they grow old. However, this is only a case of “correct observation but weong conclusion” People don’t lose their teeth because they are old, they lose their teeth because they suffered terminal chronic periodontal disease with severe bone loss around the teeth. Advanced periodontitis is the final and most severe condition of gum disease. At this stage, quite a lot of the bone and supporting soft tissues around the teeth are lost or damaged. Without proper support, the teeth will start to become loose. Depending on the degree of bone loss, sometimes the teeth can be saved by frequent and intense dental treatments with a dentist or specialist to remove the plaque below the gum lines. This procedure may take months or years to complete and be effective. If the build up is very advanced, surgical procedures to lift the flap may be needed in order to thoroughly remove all plague and bacterial. If no remedial action is taken, all teeth will become loose and will eventually be lost. The first thing is to learn how to brush your teeth properly. Proper brushing and flossing can eliminate the plaque between the teeth. However plaque left below the gum line when not removed thoroughly, will turn into tartar can only be removed by dental professionals. 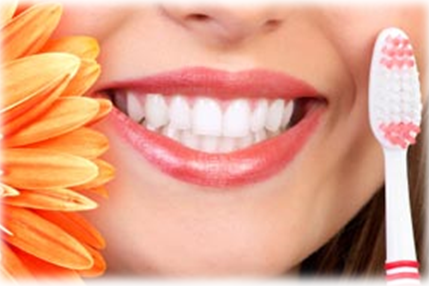 Therefore your regular visit to the dentist is the key to prevent gum disease. Preventative care is incredibly important, and with dental professionals at Bondi Dental, you can get the care and services you need to achieve excellent oral health. If you wait until you have a problem before you go to the dentist, you can end up with a wealth of issues that are too expensive, painful, and even potentially deadly. One of those problems is periodontal disease. It is essential that you join Bondi Dental’s Active Maintenance Program and keep your regular dental appointments every 6 months for a professional examination and deep cleaning of your teeth to protect yourself from this dangerous disease. In fact, dentists and dental professionals are the only people that can protect you from this disease. In most cases, the symptoms are not easily detected until the problem becomes more severe. Our dental professionals at Bondi Dental will carefully examine your oral condition to detect any signs of gum disease and provide you will necessary treatments to prevent or stop further deterioration of teeth and gums. Call us now, at 02 9365 7187 to make appointment with our Bondi Dental professionals if you suffer from any of the above conditions, or wish to start achieving optimum oral and overall health.